The Prestige N1 apartment is the only one of the Prestige apartments with a private in-house sauna. This apartment is split over two levels with 3 en-suite bedrooms as well as the open-plan kitchen, living and dining area located on the ground level and the 4th en-suite bedroom as well as private sauna and extra shower room situated on the lower level. Mountain views can be enjoyed from a south-facing balcony with outside seating that’s accessed from the living area! One of the bedrooms also has a private balcony with the same stunning views. New this year is the access to a Netflix account! This enables you to view many international movies, documentaries and series – Perfect for a snowy evening in the chalet! The chalet residence that has been built into the slope next to the village piste which gives most apartments direct access to the ski slopes. 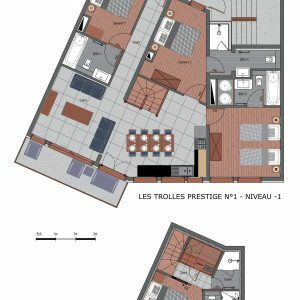 Whilst on foot you will have to climb some stairs to get to the Prestige apartments’ front door it also means these newly renovated luxury apartments are extremely affordable and would be much more expensive if situated in a free-standing chalet. 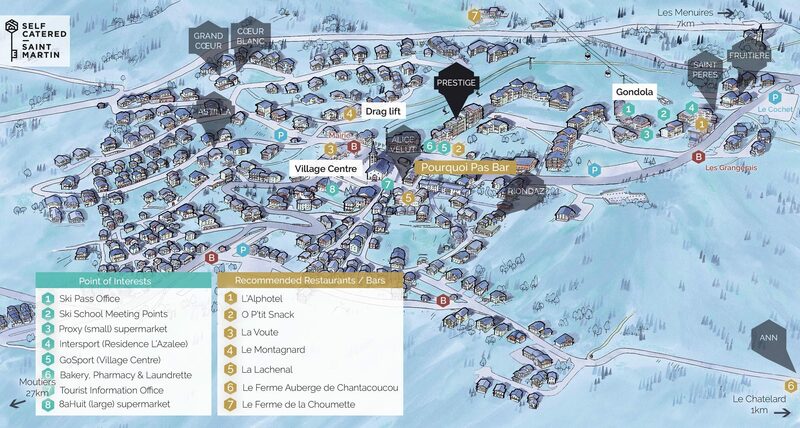 Prestige N1 is the closest apartment to the village centre. It is situated 4 flights of stairs up from the village centre and 6 flights of stairs down from Rue des Grangeraies.